The best time to visit the islands is from April through October.However,you can also visit from November through March which is during a rainy season so visitors may have to experience stronger winds and bigger waves. The karimunjawa islands are accessible by air from Semarang,there is a regular flight which served by deraya Air taxi from Ahmad Yani Internatinal Airport-Semarang to karimunja Island and takes about 30 minutes.If you prefer on going by boat,you need to go by bus first to Jepara Town either fro Semarang or Demak or Kudus. Jepara is about 70 km away from Semarang.There are regular voyages which connect jepara and Karimunjawa island ivce versa. This activities can be done at Karimunjawa Island, Kernujan Island and Karang Island which most of them covered by any type mangrove. Visitor can enjoy the sun bathing at westside of Menjangan Besar Island and the northwest of Pulau Cemara Kecil Island. There are 33 species of bird land and coastal, while in the year of 1991 found 52 species of bird land in Karimunjawa Archipelago. Just visit The island of Menjagan Besar dan Kecil,the westside Bengkoang Island , around Kembar Island and teh northside and East of Island Krakal. Visitors who are interested in diving can visit North And West Karimunjawa Island, the east side of Menjangan Besar island, the south side of Menjangan Kecil Island, the south and west of Geliang Island, and the side of Bengkoang Island,Parang Island, east side of kembar island,around Katang Island,the north and east side of Krakal island,The west dan north side of Kumbang Island and around Karang Besi. Ceremony of the Roll-Out of Boat is a event of thanks which was finished the production of the boat. AS one of holly well at Parang Island.Local people believed if discover water in the well and able to bring it out then the fortune will comes. 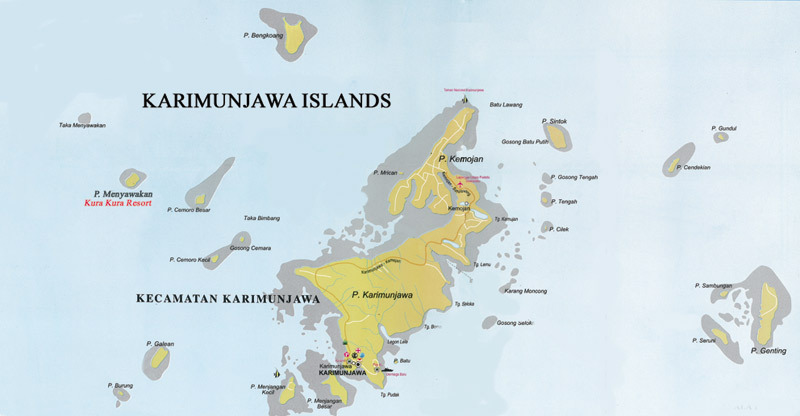 The diversity of the ethnic group that lived in the Karimunjawa Island was assets for the cultural tourist attraction The Bugis house of the ethnic group's tradition could be seen in the Batu Lawang Hamlet, Dukuh Legon Gede and Dukuh Tlogo (the Kernujan Island). For the Buton ethnic group could be seen in the Island of mosquitoes. Coconut tree is easier to find at tmost of island here such Menjangan Kecil island,Menjangan Besar island,Bengkoang island,menyawakan Island and Kembar island.